While Marriott has been merged with SPG officially by the end of 2016, they’re continuing to run their individual loyalty programs for the time being, at least for the short term. 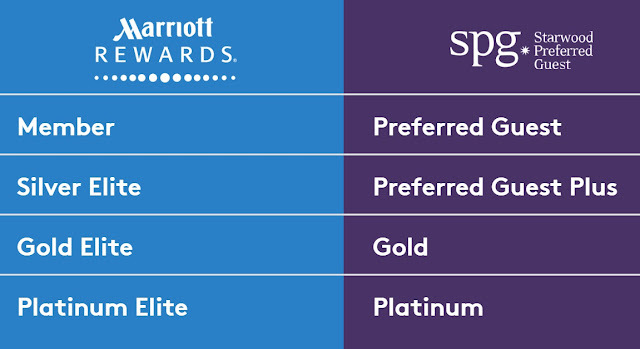 There's one great change to maximize your SPG points, however, by making use of Marriott's exclusive Hotel+Air packages. Those packages have been overlooked because of the fact that they require tons of Marriott rewards points. But since now points can be transferred at your ease with a ratio of 1 SPG point: 3 Marriott Rewards points, it is much easier to redeem those packages. As we have mentioned, SPG points are now on sale at 35% off, and it is definitely worth buying if you are trying to redeem Hotel+Air packages. The rules regarding the redemption of the packages will be a headache if you are new to this, but here I will only talk about the packages that I recommend redeeming; scratch other packages since they are not as good as they seem to be. There are a few package tiers, but we only recommend you go with RewardPlus or Tier 1(See the chart for details). Reward Plus will give you an extra 10% of airline miles than tier 1. Other tiers are not worth redeeming unless you have strong need for them. And there are several ladders of redemption in each tier: ranging from 50 K miles to 120 K miles with the fixed 7 night hotel packages at different categories. Again, I have circled the ones I recommend in blue. Personally, I usually redeem Cat1-5 Marriott 7 nights + 120 K airline miles when they have promotion (for example, Aeroplan once had the 30% bonus promotion, which means you will get 156 K aeroplan miles...). The airline miles you are getting are usually more or less enough to supply you with a round-trip long haul business class fight (usually valued at at least 3000 US dollars).And the 7 night packages are extremely worth the value if you are taking a vacation in many of the Asian countries. In Canada, I found them valuable in Toronto Courtyard, Calgary Marriott Downtown, Ottawa Delta, etc. With the SPG buy points 35% off promotion, you can easily collect 30K SPG points (90 K Marriott Points) at discount rate, here's the link to buy SPG points: Buy point now.